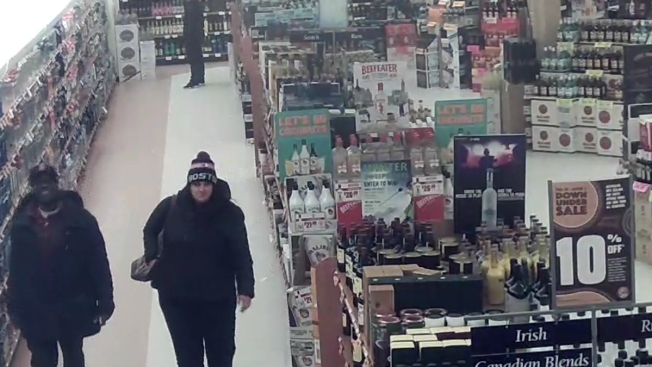 Police are looking for the public's help in identifying these two suspects in the theft of alcohol from New Hampshire state liquor stores. State police are investigating the theft of nearly $1,000 worth of liquor from the New Hampshire Liquor and Wine Outlets on both sides of Interstate 93 in Hooksett. Police say the thefts happened on Thursday night at the stores, which are part of rest areas along the interstate. They say numerous bottles of alcohol were taken. They are requesting the public's assistance in identifying a man and a woman considered persons of interest. Anyone with information on the two subjects is asked to contact state police at 603-271-1162.